You must provide accurate information, or your registration may be canceled at any time without notice. Registration is restricted solely to the registrant and cannot be shared with any other parties. If you believe any information has been compromised in relation to your enrollment in one of GTC Institute’s course, please contact us immediately via email in relation to your program. GTC Institute LLC reserves the right to change, suspend, or terminate access at any time due to lack of payment for a subscription. You authorize GTC Institute use of your name, photo, voice, testimonial, and other relevant information to be used only for promotional or marketing content, digital or print, in relation to the course or courses you participate in. You acknowledge you will not be compensated for use of your information and waive rights to claim against GTC Institute including claims of defamation, a right of publicity, copyright, or any other violation of law. GTC Institute offers subscription-based payment plans to prospective enrollees. These subscriptions will be billed automatically on the same day of the month each month through the same credit/debit card until completed or canceled. GTC Institute reserves the right to change terms of the subscription at any time including the price and length of which you will be notified. By subscribing to a payment plan pricing will remain for the duration of the plan and there will be no adjustments based on new pricing or promotions that become available after you subscribe to a payment plan. Cancellation of subscription prior to completion will result in loss of access to the program and forfeiture of previous funds paid as apart of the subscription. By enrolling in the subscription, you agree to begin enrollment immediately and are not entitled to a refund except as defended by the refund policy. To cancel your subscription please call 305-503-9050 or send an email. GTC Institute LLC offers a 14 days refund policy from the date payment was submitted to GTC Institute LLC. Refunds can be redeemed by either calling 305-5053-9050 or sending an email along with the reason for cancellation. Any requests made after the 14-day period will be denied. Book purchases are final and will not be refunded. If you purchase a package that includes the book the value of the book will not be refunded. GTC Institute will not allow the transfer or substitution of the course or courses. GTC Institute offers self-study courses only. Courses must be complete within 1 year of registration date with a satisfactory score of 80% to earn certification. If course is not completed within the timeframe a new registration will be required and a discount may be offered. In order to access the course or courses a computer is recommended either Windows 7+ or Mac iOS and a stable internet connection is required. 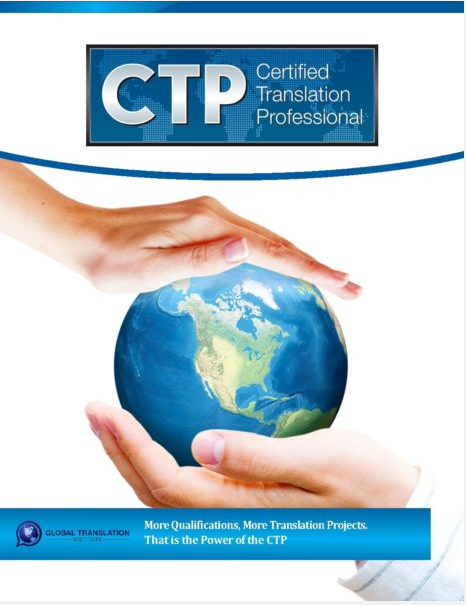 The Global Translation Institution accredits the CTP in offering an exam to test student’s competency in translation. Passing the exam and earning their designation as a Certified Translation Professional (CTP). Upon completion of the course and earning this designation you are able to demonstrate that you are a professional in the industry. This will not only show your competence but enhance your growth in the industry through the certifying translation school. Candidates who passed the CTP certification exam are entitled to use the designation CTP designation after their names. GTI-Certified Translators may also refer to their certification on or in connection with resumes, cards, stationery, websites, advertisements, professional literature, and the like. The CTP designation may not be used in a misleading, inaccurate, fraudulent, or illegal manner, or for other improper purposes. The CTP designation should include the language pair and direction. Where possible, the language pair(s) and direction(s) of the certification should be provided to most accurately reflect the certification. 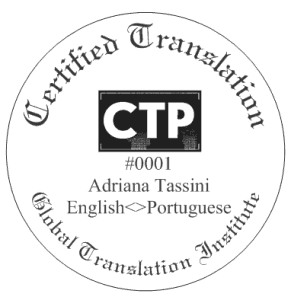 The CTP designation is owned by GTI. Any improper use of the CTP designation is subject to review and approval by GTI. The association also reserves the right to take legal or other action to protect its rights in the event of any unauthorized or impermissible use of the CTP designation. The CTP Digital Seal uses. Any improper usage of the CTP seal is subject to legal action by the GTI. The Association reserves the right to remove and revoke any misconduct or misrepresentation of the seal. All rights and authority are approved by the Global Translation Institute.